THE SITCOM “MODERN FAMILY” HAS become one of the most popular shows on TV, a ratings and critical success. With its unique blend of quirky characters, sharp wit and heart, the show has become a cultural phenomenon. Based in Southern California, the show centers around the Pritchett family. The patriarch, Jay Pritchett (Ed O’Neill), is wealthy and successful. His wife left him and he has remarried a Colombian bombshell, Gloria (Sofia Vergava), close to half his age. Consequently, he is now the stepfather of her pre-teen son, Manny. Jay has two children. His daughter Claire (Julie Bowen) and her husband Phil (Ty Burrell) are the anchor nuclear family, with two teenage daughters and a pre-teen son. Her brother Mitch (Jesse Tyler Furgeson) is gay and lives with his partner Cam (Eric Stonestreet) and their adopted Asian daughter, Lily. These relationships can be as confusing as they sound. Claire and Mitch’s new stepmother is close to their age, and Gloria’s son Manny is in the same class as his “nephew”, Claire and Phil’s son Luke. Jay is a classic man’s man who is not fully comfortable with his son being gay. The relationships are complicated and ever changing. The show’s charm can be attributed to a number of factors. First, the show is exceptionally well written and acted. Second, they don’t pull punches. The characters make fun of each other and openly discuss complicated issues of family dynamics. They make fun of themselves as well. Mitch and Cam constantly make fun of gay stereotypes and Jay and Gloria will comment on their age disparity and cultural differences. At the same time, like any good sitcom, the characters ultimately show compassion and forgiveness. Their love for each other ultimately carries the day. On a deeper level, the show is speaking to a very modern phenomenon, one that is at the heart of a major crisis for the Jewish people, especially in America. The American landscape has in many ways had a boom or bust quality to American Jewry. It has been a safe haven for our refugees and Holocaust survivors, and a safe place to freely practice our faith. It has seen a boom in diverse forms of Jewish learning and experiences, and Jews continue to achieve unparalleled success in all walks of life. At the same time, assimilation has become an epidemic. Large segments of the Jewish population are apathetic to Jewish life, and within one generation we are at risk of losing millions of Jews who will disappear into the world of American secularism. The biggest challenge can be connecting Jews to the concept of being part of the Jewish people. There are many things that hold back the modern Jew from deeply connecting with the Jewish people. Many American Jews identify so strongly as Americans that they don’t feel a need to simultaneously feel a dual identity. For some, their connection to Judaism is so weak there is no reason for it to be a defining element of their lives. For others, the diversity of the Jewish people holds them back. Let’s be honest, how connected does a secular Jew living in Beverly Hills or Boca Raton feel to a Chassid in Williamsburg, a Sephardic Jew in Petach Tikvah, or a Russian Jew in Moscow. If they could have dinner with a non-Jewish co-worker or a fellow Jew from a different cultural background, what would they choose? What would we choose? It can be difficult to feel part of a people when there are so many Jews who we feel we have so little in common with. This is true for all parts of the spectrum. How connected does the Chassid in Williamsburg feel to the secular Jew in Beverly Hills? This is not just a Jewish problem, it is a modern problem. Families today simply look different then they used to. Many barriers on who we are allowed to marry have broken down. “ Guess Who’s Coming to Dinner” came out forty five years ago (It is a must-see movie. The original version, not the Ashton Kutcher monstrosity of a remake). Young adults are criss-crossing the country, meeting people in and moving to cities far from home. The modern family is learning how to welcome and incorporate people from different backgrounds into their families, and it can be complicated. The modern American Jewish family is no different. Looking at family wedding pictures is often an exercise in multiculturalism. Just look at the family pictures from my wedding. The Chassidim are standing and smiling with the Modern Orthodox, Conservative, Reform, Assimilated and non-Jewish members of the family. This is the nerve that “Modern Family” is touching. We are learning as a society that being a family starts with a commitment to be a family, however it ends up looking. Today, more than ever, being part of a family is a choice we are actively making. The characters on the show are not a natural fit. Jay is conflicted about having a gay son, so his relationship with his son’s partner can be strained. His relationship with Cam’s parents is just as complicated, as they try to grapple with the same reality. Mitch and Claire try to figure out how to have a relationship with a stepmother their age. What carries the show is an overriding commitment to keeping the family together and making it work, even though logic would dictate that this family is too diverse to stay together. We need to look at the Jewish people the same way. Being part of the Jewish people is a commitment to being a part of a very special family. There will be large segments that you don’t relate to and can’t even communicate with. There will be times that you strongly disagree with positions and approaches of your fellow Jews. What must carry the day is a collective commitment to keeping this nation, this family, together. An understanding that ultimately we come from a shared past and look forward to a shared future. That we have a special message to bring to the world and a unique vision and understanding that has made the world a better place. That we can openly discuss the issues that unite us and divide us, and that this process only strengthens us. We can disagree, even strongly disagree, but still feel a common bond. Still feel it is our shared responsibility that the Jewish people remain strong and that we play an invaluable role in bringing morality and Godliness to the world around us. 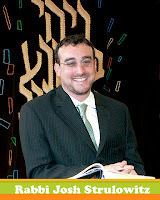 Rabbi Josh Strulowitz is the rabbi of Congregation Adath Israel in San Francisco. Follow him on Twitter at @RabbiStrul.